Developer Nielson Properties has submitted a new DA with a striking new design for its planned 500 George Street tower. 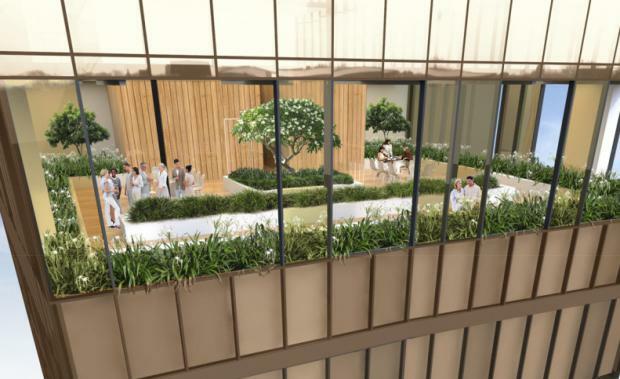 The 60 storey residential tower, which is situated on the corner of Roma and George Streets and opposite the Brisbane Transit Centre and Roma Street Railway Station, will have a distinctive black and gold facade that will make it an instant landmark. The capitalisation of city views. The building orients itself towards the north east and south west, where units on both sides have maximum views. The majority of balconies feature sliding stack glazing units predominately on the lower floors, where noise and privacy may be an issue, and on the upper floors, where wind and whether may be an issue. These sliding stack glazing units offer residents maximum control to the level of enclosure of the balcony and maximum flexibility in the use of these spaces. Balconies are seamlessly extending off internal living spaces which reinforce the outdoor / indoor connection and experience. Extensive rooftop recreation deck which provide generous, usable and well-connected amenity to residents. The use of glass will reflect its surroundings, creating a dynamic façade, while the expressed edges create a dialogue with its surroundings. No physical alteration will be done to the exterior of King George Chambers as the property is listed on the heritage register.